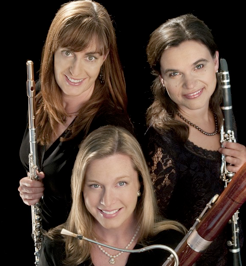 Title: Classical Revolution: LA First Saturdays Happy Hour with Ceora Winds! ceora_winds.png, image/png, 246x266 Classical Revolution: LA's Happy Hour at Silverlake Lounge has rapidly become a destination for early Saturday night drinks with an outstanding line-up of music. February features the talented husband and wife team of Michael Mortarotti, saxophone, and Erika Tazawa, piano, performing new music and original arrangements with flutist, Sarah Robinson and special guests! Ceora winds will feature Mexican composers, Enrique Gonzalez-Medina, Miguel Bernal Jimenez and Silvestre Revueltas. The ensemble brings their original, fun and creative brand of performance to this funky little bar! Ceora Winds has been performing together for 10 years and whether they're reciting poetry or playing devilish music with absolute unanimity, they are sure to keep you entertained! Classical Revolution: Los Angeles presents chamber music in relaxed, accessible venues throughout the greater Los Angeles area. Called an "addictive new series" by Mark Swed of the L.A. Times, concerts are performed at coffee shops, bars, clubs and even outdoors! Classical Revolution was founded in 2006 at the Revolution Cafe in San Francisco. The Classical Revolution model has spread around the world, with over 30 active chapters in cities around the US, Canada and Europe.